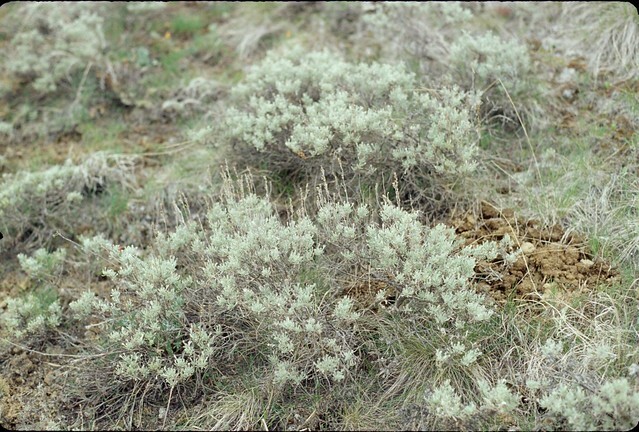 Three-tip sagebrush is a rounded, freely branching, evergreen shrub. Its leaves are gray-green, long, and deeply cleft into three lobes. The stems are a smooth pale gray. Three-tip sagebrush carries the distinctive sage fragrance, especially when wet. The flowers are green and inconspicuous. It has a very slow growth rate, reaching a height of one foot after twenty years, and a mature height of four feet. Three-tip sagebrush is intolerant of shade. The light seed of three-tip sagebrush is wind dispersed but this plant can also sprout from shallow, lateral roots or the root crown, and in some cases, by layering. In layering, a branch or stem comes in contact with the soil and sends out roots. Once rooted, the branch can be severed from the mother plant, roots and all, and planted elsewhere. Three-tip sagebrush is not a preferred browse in the Sage Hills but is used occasionally by mule deer in both summer and winter. Jackrabbits, chipmunks, and pocket mice forage on the plant.